Watertec Enterprises was incepted in the year 2005 and is doing exceedingly well under the leadership of Mr. Biswajit Barik. We are leading manufacturer, trader and exporter of RO Systems, Water Softener, Ultra Filter Plant, Media Filtration Plant and much more. We are also a service provider of RO System Rental Services. These find their application in house holds, communities, Universities, Hospitals and clinics, Hotels and restaurants and all industries. These are being manufactured as per industrial standards by using high graded high graded Piping, fitting, pumps and electrical panels. Along with high quality range, we provide our clients with various kinds of services for improving processes, drive down costs, and boost profit. Our team works with the clients to get a complete water-treatment program matched to their needs. Being a quality centric company, we provide our clients with range which is stringently tested as per industrial standards on various parameters. Moreover, these can also be provided in customized specifications to meet the varied client’s requirements. Our organization works under the mission towards creating hygienic water conditions thus making the planet better place to live. We have been able to make an everlasting impact in the market which has come solely due to our high-quality water treatment plants. We aim to be a top notch organization by providing our clients with plants which give them crystal clear water ensuring a healthy and longer life. To do this, we focus on developing strong customer distributor or and principal relationship by providing the highest quality product and service at a competitive price. Our market surveyors perform informative market research surveys to correctly gauge the response towards our range in the market. These tests are performed by a team of highly qualified team of research specialists who work as per industrial standards. Our increasing clientele gives a comprehensible reflection of our fidelity towards complete client’s satisfaction. It is an achievement for us that we have kept our clients completely satisfied with our high-quality water treatment plants and ethical work practices from the last nine years. Our technological proficiency and strong customer focus enable us to provide our water treatment plants in customized specifications to suit varied client’s requirements. We also provide our clients with packaging facilities by using high graded packaging material according to the client's specification. Moreover, our minimum lead time delivery has given our clients cushion to make bulk orders on a short notice. We have been able to earn a respectable position in the market due to the hard work and dedication that is being put in by our adroit team. They are fully committed to fulfilling the client’s requirements with utmost precision by working with them in close proximity. Their expanded knowledge about the latest technology and sophisticated machines enable them to carry out safe, quick and efficient production process of our water treatment plants. Their regular training sessions provided by us have made their skills and knowledge base enhanced. 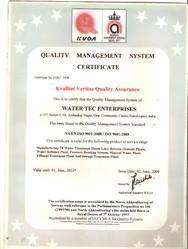 VC Watertec Equipments Pvt. Ltd.